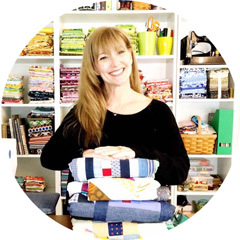 Okay, I WISH I was playing with Pat Sloan but I have the second best thing...her NEW fabric line for Moda!!!!!!! Bobbins and Bits is so colorful and has DOTS!!!!! I have a special place in my heart for dots and cannot seem to resist them. Pat asked me a few weeks ago if I would like to play with her new line and I may have been more than a little excited at the chance. So, this week it came in the mail and WOWIE WOW WOW! I have been cutting like a fool and have this to show so far. Here's to hoping for no mistakes,LOL!!! and it even makes pretty scraps! jumping up and down squealing!!! yeah! I have always loved Pat Sloan's fabric. I still have bits and pieces of her some of her older collections. You will make something fab! Right, I'm off to google how to befriend some awesome fabric folk!! This is such a sweet line... love the designs and colour combos!! This fabric line just looks wonderful! Can't wait to see what it will become! Gosh! Her fabric is just soooo gorgeous!!! can't wait!